San Diego Network Cabling & Wiring is a fiber optic cable installation contractor offering a wide range of optical fiber services, including installs of single or multimode fiber; fiber optic cable testing & certification; and fiber optic cable termination (ST - SC - LC - MTRJ connectors). We will ensure quality control throughout the process and strive to exceed your expectations each step of the way. Cat 5e, Cat 6, Fiber Optic, Wire Management, Patch Panel Termination, Testing, Certification and 25 Year Factory Backed System Warranty. 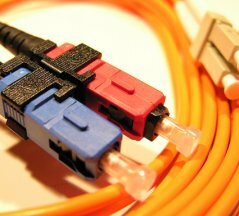 We also offer San Diego fiber optics installation including flexible innderduct, rigid inner duct and corrugated tubing.